"Tundra" is the first of two new comic strips to charm readers of the Star-Bulletin's print edition. In today's comics section, we debut two new strips, one from the Last Frontier -- Alaska, that is -- and the other from the fertile minds of two East Coasters, about young office drones done up as animals. 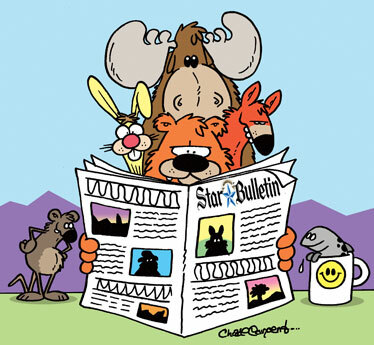 The "Tundra" and "MyCage" comic strips appear in the print edition of the Star-Bulletin only. For more information about either, see their respective websites. The strips replace Allison Barrows' "PreTeena," which ended its run last week, and the slot shared by our two local contributors, Jon Murakami and Dave Thorne. The local strips are moving to Page F10 in the Sunday Today section. Welcome Chad Carpenter's "Tundra" and "MyCage," by Ed Power and Melissa DeJesus. Carpenter -- who lives in Wasilla, a farm town just northeast of Anchorage -- has been called "Alaska's most beloved and famous cartoonist." To that you can add Alaska's ONLY cartoonist, albeit one whose funny strip appears in more than 150 newspapers worldwide. "We're almost at 200," Carpenter said by phone from his home last week. "I'm very surprised. ... I thought 'Tundra' would do OK in Canada, at best, but the success of it has totally shocked me. ... I think what helps is that it's not just a regional strip, and it's understandable to anybody with half an education about Alaska." Carpenter's colorful main characters inhabit Gangrene Gulch -- Andy the Lemming, Sherman the Squirrel, Dudley the Bear, Whiff the Skunk and even Chad the Cartoonist, who usually ends up suffering the hi-jinks of the animals. And through his Web site at tundracomics.com, Carpenter occasionally illustrates joke ideas from readers. Carpenter favors drawing while lying in bed in the home he shares with his wife and three children. "I have two drawing tables and I never use them." Finding pun-worthy material in wildlife seems to be no problem to Carpenter. He's lived in Alaska since age 2 and enjoys the great outdoors. "I have no interest in hunting, but I do love the outdoors, specifically hiking and kayaking." Carpenter has been nominated for newspaper panel cartoonist of the year in this year's National Cartoonists Society's Reuben Awards -- previously won by two other creators whose strips appear in our Sunday paper, Jerry Van Amerongen ("Ballard Street") and Mark Parisi ("Off the Mark"). "When I attended for the first time last year, when it was in Orlando," he said, "it was like the mother ship had picked me up and deposited me in the midst of a bunch of grown adults who make a living making goofy pictures. It was surreal to be with cartoonists whose work I grew up with, and it was an incredibly fun time." "MyCage" is the second of two new comic strips to charm readers of the Star-Bulletin's print edition. The creators of the manga-styled "MyCage" are able to keep in regular contact with their readers via the strip's MySpace page. "It's lots of fun not only writing the strip, but I get to do all the interaction with the fans," Power said by phone from his New Jersey home. "With the addition of our blog, I think we get more feedback than most other strips. The best part of it is how our readers relate to the characters, like how much they act like their friends." The inhabitants of the "MyCage" world are led by Norman, a young platypus stuck in a middle-management job, and his girlfriend, Bridget. Power said Norm "is also a writer, but not a very good one." Like Carpenter, Power and DeJesus enjoy the larger palette the Sunday comic form has to offer. "Mel's a really good artist, and we like to do things like sequels to movies and taking on bad fan-fiction. We also plan to do something based on reality TV." "MyCage" celebrated its first anniversary this month, and Power said "it's doing well with teens and 20-somethings." Illustrator DeJesus graduated from the School of Visual Arts in New York in 2002, and made her name working on the graphic novel series "Sokora Refugees," published by Tokyopop. "I initially wanted to do a different style of drawing than the anime/manga style I've been known for, but the editor at the syndicate specifically asked me to do a strip in that style. It took a while to get a complete look and design we were all comfortable with, but it's worked out." Sometime next month you'll see the two do their take on Dr. Seuss, complete with rhymes. While fans of DeJesus' "Sokora Refugees" and those who love "MyCage" are unaware of each other, she hopes that future projects will let her integrate the two fan bases. "I hope to do more stand-alone graphic novels and kind of explore creating stories with my own writing. In the meantime, I hope your readers will enjoy the Sunday 'MyCage' strips, where Ed and I get to be a little more creative."